We are running an integration where JotForms data is pulled into Zapier, and Zapier places a file in DropBox. For some reason, the data being fed from JotForms to Zapier is not correct. Zapier has ran issue logs and believes it is being sent wrong. Thanks for sending those over! It looks like the values we're getting from JotForm are N/A if you look in the Data Out area here (https://zapier.com/app/history/50663dab-7b26-4bc0-8665-077c24001119), so the disconnect seems to be on their end as what their API is providing to us. We don't show any errors on our side that would prevent this information being pulled. Can you double check in the fields you've mapped within your Zap, and that they are carrying that value over appropriately? · PERMANENT RESIDENT OF THE U.S.
· Have you satisfied the required pre-requisites for Trinity School of Medicine? · HAVE YOU APPLIED TO TRINITY SCHOOL OF MEDICINE PREVIOUSLY? · HAVE YOU ATTENDED MEDICAL SCHOOL IN THE PAST? · HAVE YOU EVER WITHDRAWN FROM MEDICAL SCHOOL? · HAVE YOU EVER BEEN CONVICTED OF OR CHARGED WITH ANY VIOLATION OF THE LAW (FELONY OR MISDEMEANOR)? · HAVE YOU EVER BEEN DISCIPLINED BY ANY LICENSING OR CREDENTIALING BOARD? · HAVE YOU EVER BEEN DISCPLINED BY ANY INSTITUTION OF HIGHER EDUCATION FOR VIOLATION OF INSTITUTIONAL RULES AND REGULATIONS GOVERNING STUDENT BEHAVIOR? · How did you first learn about Trinity School of Medicine? fields__If Student or Alumni referral please list name. Can you please provide us with a form link in question? Are you referring to N/A values as incorrect data? Oh, sorry! I thought I pasted the URL. And yes, the N/A as incorrect data. A bug report ticket has been attached to this thread and forwarded to our Development Team. We will let you know when we have any updates on this. 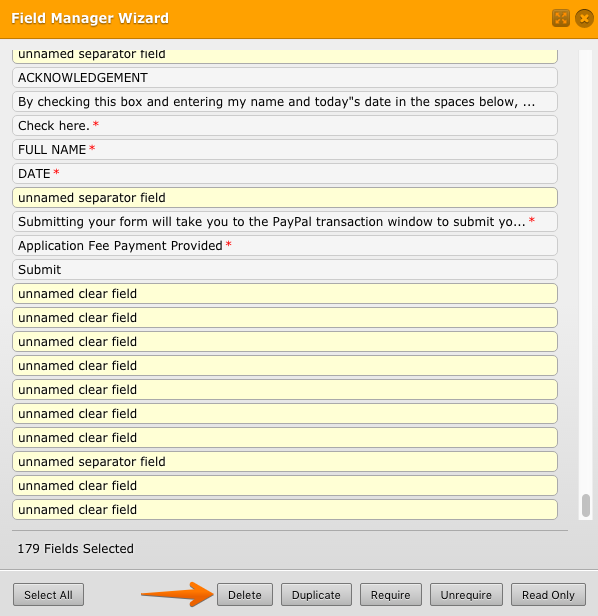 Can you please confirm if the issue is still affecting your new form entries? Yes, it is. I just submitted a new one under my name and the same thing happened. Sorry for this inconvenience. As my colleague indicated, he already opened a ticket for our back end team to review this issue. As soon as we have any update on the progress you will be informed through this thread. Do we have an update on this? I haven’t heard back since Wednesday, and this needs to be resolved ASAP. The issue is somehow related to that specific Adobe FormsCentral migrated form. I have removed migration layout elements, and also switched Date fields from lite to normal mode. It seems to be fixed the problem on my side. Please inspect your next form submission to see if it is delivered correctly. Sorry for the late notice, but I just wanted to check in. Are you still having such issues with your form?